Explore the eLearning Interaction Building Tools Comparison sheet that enables Instructional Designers, content creators, and Subject Matter Experts to present their content interactively. This sheet lists various features that an interaction building tool should have and the support of various tools for those features. 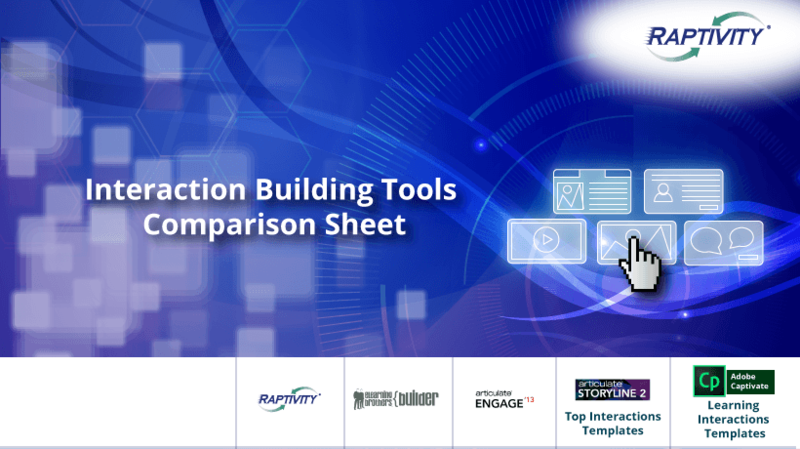 Raptivity team has created the first ever eLearning Interaction Building Tools Comparison sheet. Here, you will be able to explore and compare the various features learning professionals need their eLearning interaction building tools to have in order to present their content interactivity. Interactivity in eLearning courses helps foster active learning through a meaningful exchange between the content and the learners. There are several tools available in the market whose features can be leveraged to design and deliver exceptional learning experiences. In this exhaustive review, we have compared Raptivity, Articulate Storyline 2, eLearning Brothers, Articulate Engage ’13, and Adobe Captivate 9 on various parameters. These parameters are vital for Instructional Designers and eLearning course developers to design, customize, and use eLearning interactions effectively. Do note that Adobe Captivate 9 and Articulate Storyline 2 have been evaluated for their interaction templates, and not for their course authoring capabilities. Variety of interaction templates and questions. Publishing and integration support with other authoring tools and Learning Management Systems. User experience while using the tool. These parameters bring out the best features and enable Instructional Designers to explore interaction-building tools at a completely new level. Let us glance through the comparison to get a better idea. Raptivity leads the way when it comes to variety of interactions (190+) and question templates. In addition, it also offers lot of flexibility to customize the templates. Even with templates, it gives a lot of room to flexibility and creativity to the user of the tool. An Instructional Designer or a course developer can select the best-suited interaction for the given content from more than 13 interaction categories like games, presentation aids, 3D worlds, brainteasers, simulations, etc. Articulate Storyline 2 offers extensive support when it comes to multimedia features. Font and language support is phenomenal across all the tools. Adobe Captivate has fair multimedia support. Its audio clip library has some amazing sound files, which you can use in developing eLearning courses. In addition, Adobe Captivate 9 offers responsive design support for its interactions, a plus point in the bag. Raptivity and eLearning Brothers interactions can be easily integrated with multiple eLearning authoring tools. Both offer a real-time preview of how the interaction while customizing it. All the tools offer tech-support. Raptivity provides a dedicated support team to help you through your queries through emails; while others offer a community based support. One needs to choose the support based on the requirements and your business need. Every tool showcased in this eLearning interaction building tools comparison sheet has its own merits and demerits. It all boils down to which tool would be apt for your project needs. Cost is another factor that would make a difference, which has not been considered in this comparison. However, if you have specific requirements, then it is evident that you would select the tool that best supports your requirements within the given budget. Then there are specific variants that are available in most of the tools; you might want to explore this aspect in regards to cost and product offerings. To give an example, Raptivity has two main packages: Essential (with 29 interactions) and Suite (all interactions). Users are free to select the variant as per their needs; they can browse through the interactions provided in each of the packsand, select the one that matches appropriately with their project, and budget requirements. Click here to get your complimentary copy of the eLearning Interaction Building Tools Comparison Sheet.